This is really worth visiting! And for me it was a great way to cap off two weeks holiday. After 10 days in Darwin with family and friends, I had arrived back in Melbourne [absolutely freezing! ], then did all those tasks you try to get done when you’re not working. Friday was car servicing day [ouch]. Saturday it was a drive into Geelong to buy my next long-term train ticket [big ouch]. Then it was time for the eye test that had been delayed TOO long [another ouch]. So driving back home from Geelong I wasn’t feeling in a holiday mode and definitely feeling much poorer! I wanted to do something “holidayish” but it had to be something that cost nothing. Then I had the answer – I had my new tiny digital camera in my bag – a birthday present I was spoilt with in Darwin. 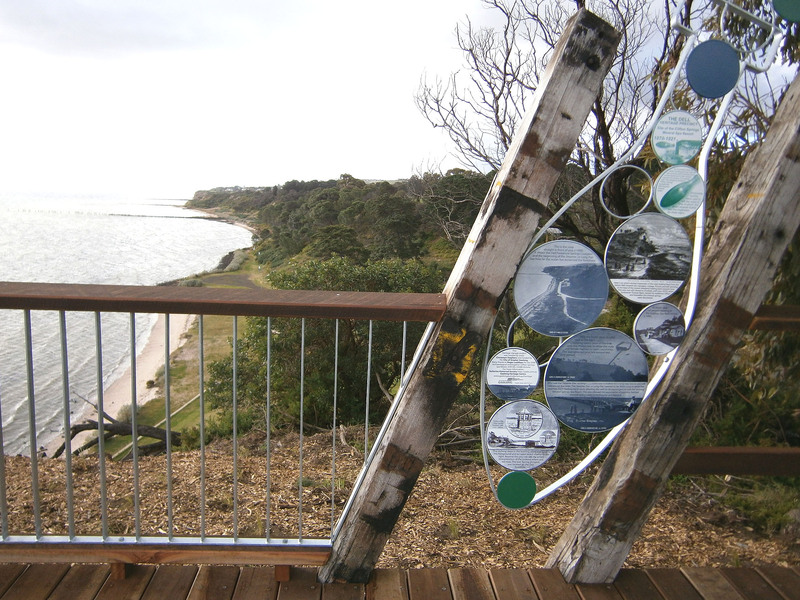 I hadn’t seen the new interpretive signage at the Dell at Clifton Springs – so I detoured up to the north of the Bellarine Peninsula. 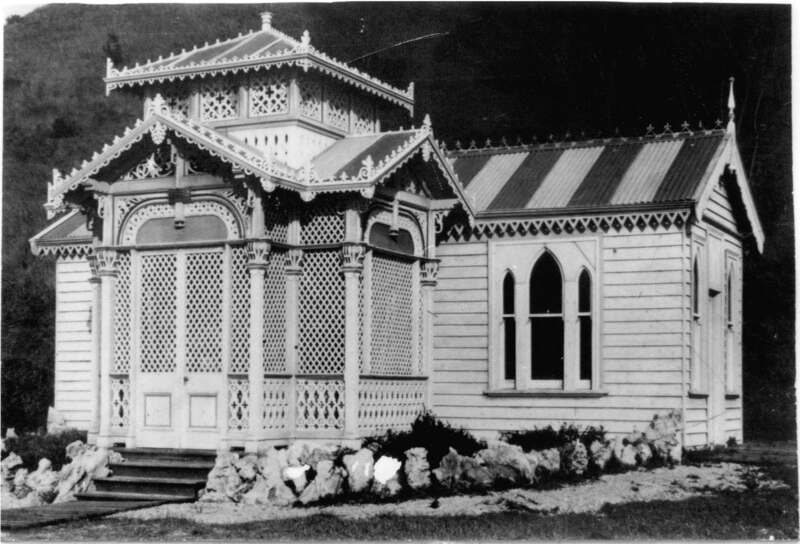 Clifton Springs has a wonderful history – the first mineral springs and spa in Victoria – but very little of that history and heritage have survived. In 1998 the City of Greater Geelong commissioned archaeologist Roger Luebbers to investigate the area. A second more detailed report followed an initial archaeological dig in 1999. Through the Bellarine Historical Society I spent some time with Roger providing the information and photographs that the Society had in its collection for these reports. Roger made several recommendations however nothing more happened until 2007 when a large archaeological dig was commissioned by the City of Greater Geelong. I was so fortunate to work with Roger on more detailed research on the site at that time – the sort of research we could not have justified for the Society. It was also exciting to spend time at the site to see what had literally been unearthed. The end result was more recommendations together with a wonderful 121-page document with a detailed history, images, maps, plans and diagrams. Copies of this and the two earlier reports are in the library at the Bellarine Historical Society, local libraries, and at the City of Greater Geelong. If those links stop working, Google “Luebbers” and “Archaeological Investigation Clifton Springs Spa Resort”. It was November 2010 before any further action. 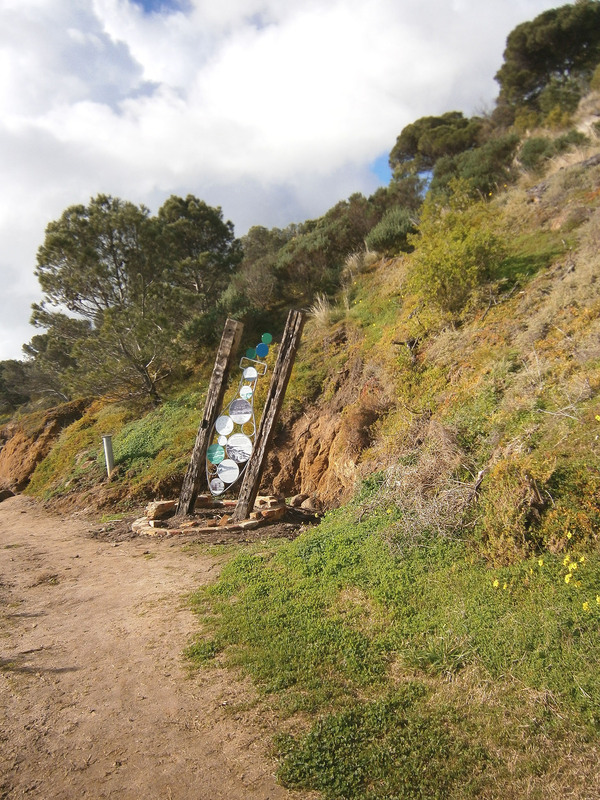 The City of Greater Geelong agreed to fund interpretive signage for the Dell at Clifton Springs. And that is what I saw on Saturday. My congratulations to all involved – it is stunning, modern, different, and certainly brings the area alive with the information about this Heritage Area – which is also on the Victorian Heritage Register. There are three main interpretive signs and they really are spectacular. Artist, Cinnamon Stephens, was commissioned to design these “signs” – and what a design! They are in the shape of a torpedo bottle – the bottles used at Clifton Springs for the mineral water. They are full of “bubbles” representing the water from the Seltzer Well. The beautiful historic photographs and text are in the bubbles. There is one at the top of the cliff above the Dell. It can be seen from the dining room and car park of the Clifton Springs Golf Club. From a distance it would be hard to resist – you are absolutely drawn to this unusual structure to see what on earth it is! From the base of this sign, a new sealed path leads you around to the bluff. Part of this project involved a new lookout built at the top of the bluff with a view across the Dell and along the shore where the Sulphur Spa Bath and Mineral Springs bottling factory were situated. A second “sign” is located at this lookout enabling visitors to visualise what it was like in its hey-day. From here it is again hard to resist the urge to do down to the Dell and see what this is really all about. Take the time to go down the steps to the Dell, and then follow the path along to the site of the beautiful Spa Bath building [the photo at the beginning of this blog]. Sadly none of the buildings have survived but we are fortunate to have many photographs in the Bellarine Historical Society collection. The third “sign” is located here and at low tide visitors can explore the wells and channels that were part of this complex. The signs include a circle of bricks at the base representing the numerous wells located at this historic site – bricks from some of the wells were used in these structures. Again, congratulations to all involved: Matthew Jackman [initially from the City of Greater Geelong and later with the TGM Group managing the project], Cinnamon Stephens, the artist, and the representatives of the local community groups who worked on the text and images for the signs. It really has ended up being a wonderful blend of modern representative art depicting an important heritage site – well worth a visit! 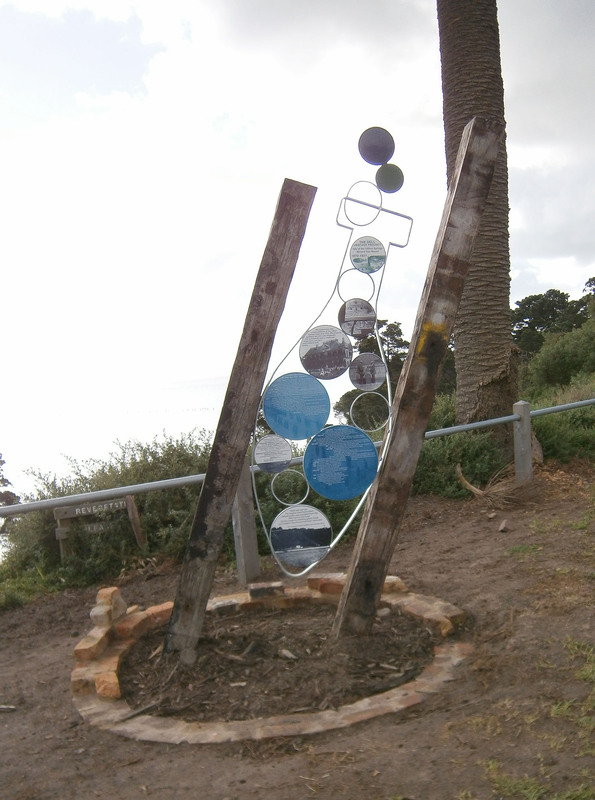 The Dell is located at the end of Clearwater Drive at Clifton Springs, near Geelong. Next Assisted Immigrants – lied about their age and/or their occupation!